Despite what you may have heard, the connection between music and exercise didn’t start with Jane Fonda’s dance aerobics or the Sony Walkman portable cassette player. Try 300 B.C. Probably even earlier. You probably don’t need an exercise scientist to tell you that music makes exercise more enjoyable, but what is its true effect on physical performance? When looking for good workout songs, find those that have a distinct rhythm and appropriate tempo/beats-per-minute (bpm) for your chosen activity. 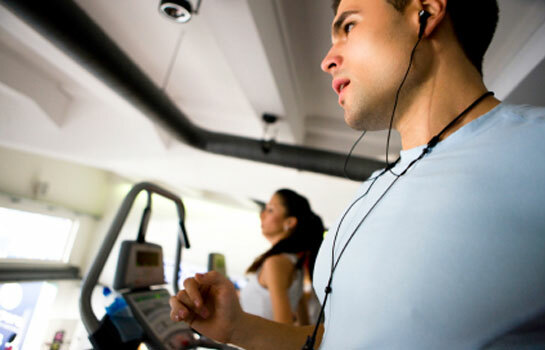 The song’s bpm should correspond to the heart rate you’d hope to have during the workout. “All things being equal, I think the stronger and more obvious the beat is, the more likely you will be to follow it,” says Foster. Over the past 20 years of research, Karageorghis has identified three primary things about music that could possibly influence exercise performance: 1) the tendency to move in time with synchronous sounds (e.g., tapping your toe in time with music or the beat of a drum); 2) the tendency of music to increase arousal (e.g., the desire to move rather than to sit); and 3) the tendency for music to distract the exerciser from discomfort that might be related to exercise. Buoyed by Karageorghis’ landmark research, Foster and John Porcari, Ph.D., have supervised more than half a dozen research studies on the effect of music on exercise intensity. As a whole, that body of research further supports the notion that synchronous music tends to drive exercise intensity (i.e., the faster the beat, the higher the intensity). Researchers also clearly identified the effect of increased arousal related to the tempo of music, thereby making intense exercise seem less stressful. What follows is a brief review of the results of the seven UWLAX music intensity studies compiled by Foster and Porcari. Zilonka, E. (1999). Effect of music programming on walking pace. Journal of Cardiopulmonary Rehabilitation, 19, 293. Using commercial exercise tapes that purport to be able to program the speed of walking, subjects performed a basic walking program. Although they enjoyed listening to music tapes (compared to the control group), there was no evidence that the pace of walking varied in response to the tapes. However, music was more likely to influence stride frequency than stride length. Schwartzmiller, M. (2003). Effects of music tempo on spontaneous cycling performance. Journal of Cardiopulmonary Rehabilitation, 23, 384. Subjects were asked to “just do a normal cycling workout” while researchers experimentally varied the tempo of the music played in the background. Pedaling cadence and power output changed in parallel with the dominant beat frequency of the background music. 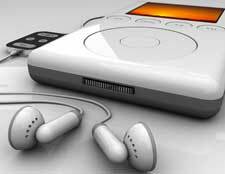 The faster the music’s tempo, the higher the power output. Johnson, V. (2004). Effect of musical style on spontaneous exercise performance. Journal of Cardiopulmonary Rehabilitation, 24, 357. As in the previous study, subjects were asked to do a “normal cycling workout” while researchers varied the tempo and genre of the music played in the background. The faster the tempo, the higher the output—the musical genre didn’t matter. Subjects were responsive to the musical tempo, even if it was in a genre of music (e.g., polka) that they were unlikely to have listened to or didn’t like. Kapingst, A. (2010). 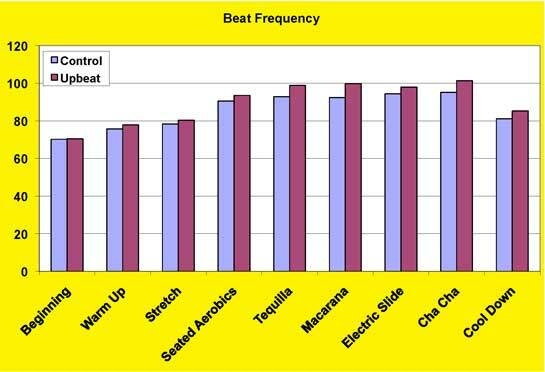 Effect of music components on exercise. Journal of Cardiopulmonary Rehabilitation, 30, 272. Subjects rode four different 40-minute cycling exercise bouts. In one bout, a series of musical tracks with varying tempos were played. In the other bouts, the subjects were divided into one of three groups and either listened to the percussion track of the same music; to a metronome with the same tempo as the dominant frequency of the musical and percussion tracks; or were part of a control trial with no rhythmic elements. Subjects followed the tempo of the metronome as much as the full music track. Power output and pedaling frequency were the same in all three tracks that included a rhythmic element, even if only a metronome. Although people clearly like the musical and percussive elements, it is the basic presence of a synchronous sound that drives the tempo of exercise. Figure 1. 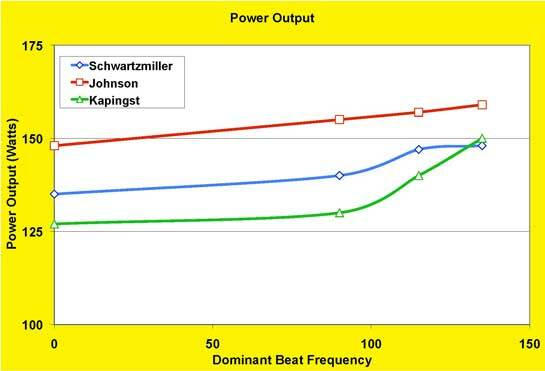 Combined data from the three studies by Schwartzmiller, Johnson and Kapingst illustrate that as the beat of the music increases, power output and resultant exercise intensity increases. Gordon, K. (2007). Effect of music tempo on spontaneous exercise intensity. Journal of Cardiopulmonary Rehabilitation, 27, 329. Figure 2. Compared to the regularly played “control” music, the same music played at a 33 percent higher beat frequency results in higher-than-normal heart rates in cardiac rehabilitation participants. Prieboy, M. (2009). Effects of auditory input on perceived exertion during cycling. Journal of Cardiopulmonary Rehabilitation, 29, 262. Subjects rode four, 40-minute cycling workouts at a constant power output while listening to either upbeat music of their own choosing (e.g., workout music), very quiet, non-synchronous music (e.g., yoga music), a comedy audiotrack (Larry the Cable Guy), or a completely neutral soundtrack (waves crashing). 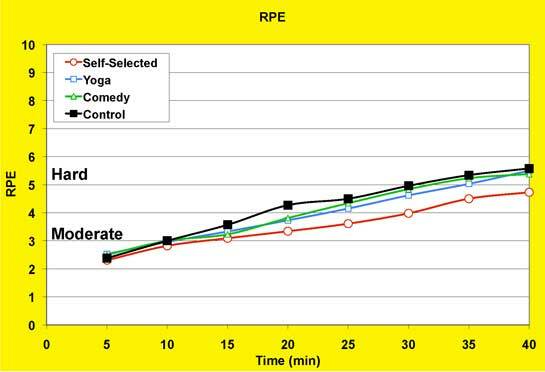 Participants’ RPE was lowest with the self-selected workout music. There were no differences in RPE between the other three types of audiotracks (Figure 3). Figure 3. Ratings of perceived exertion (RPE) were lowest when subjects listened to self-selected music, despite a constant exercise workload. Kreitiger, J. (2010). The effects of spontaneous music tempo on running performance. Unpublished MS thesis, University of Wisconsin, La Crosse. Subjects performed 30-minute runs while either listening to music of varying tempo or to a control (non-synchronous sound). There was very little difference in the pace of running while listening to music or to the control sound, suggesting that the synchronous effect of music on exercise intensity is less important during running than it is in cycling. Check out www.clickmix.com, which lets you search for songs by bpm and runtime, then create and purchase your own custom-made exercise mixes. And that kind of news is music to our ears. For more information on legal considerations for using music during classes and in the club, see “Music Management: Effectively (and Legally) Unleash the Power of Music,” by Lawrence Biscontini, M.A. WORKOUT WATCHDOG: Does the Insanity Program Produce Insane Results? GFI Series: Do Group Fitness Professionals Hold the Key to Helping America’s Youth Get Fit? What would your school do with $25,000 to improve youth fitness? ACE teams with Henkel, the company behind some of the nation’s leading consumer brands, on a new campaign to help kids get fit. ACE is regularly featured in the media, reaching more than 450 million people each year. From a Men’s Fitness article highlighting the connection between proper hydration and workout results, to WebMD discussing how to get the most out of your upper-body toning workouts, read the latest from ACE in the News.